John W. Traer, of Cedar Rapids, known among his friends as “Skinny”, platted the site of the town when the Pacific branch of the Burlington, Cedar Rapids and Northern Railroad came to the region in July 1873. The selected site was on land owned by Giles Taylor and J.L. Bull. Traer himself had owned a saloon in the new town, but although it had been named for him, he did nothing to further its development. An earlier Traer, J.C., was the clerk of court who signed orders for forming the three townships that made up Tama County in 1853: Buckingham, Indian Village, and Howard. In 1894, an iron worker in Burlington was commissioned by E.E. Taylor to construct the winding spiral stairway at 534—2nd Street as an access to the Traer Star Clipper office. Its design was constrained by the narrow proportions of the building to which it was attached, and showed imaginative use of limited space. During the bicentennial, this landmark was declared a National Historic Site, and Traer has adopted it as its symbol, along with the slogan, “Wind Up in Traer”. 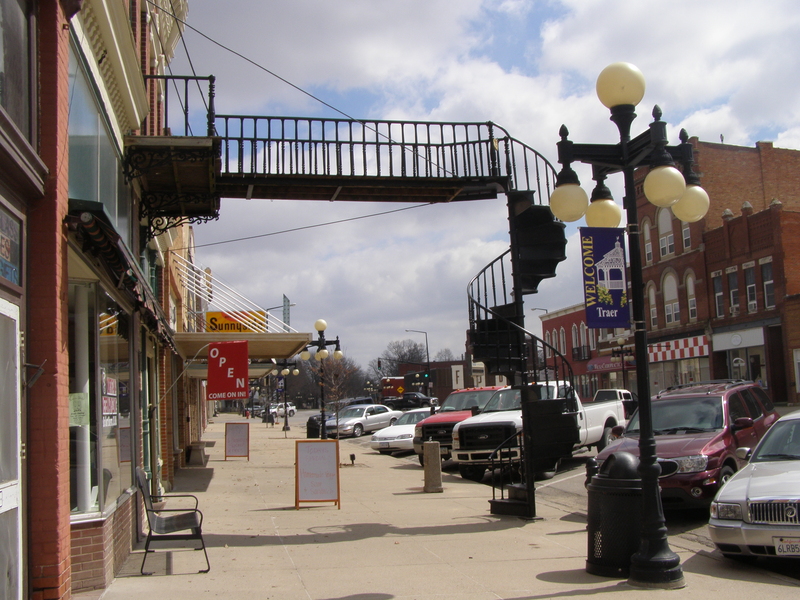 Such stairways are no longer uncommon, and those in Traer no longer lead to the newspaper office, which has been housed in a ground floor location since 1953. Among the many historic exhibits in the Traer Museum is the section honoring “Tama Jim” Wilson, who was the United States’ secretary of agriculture for 16 years. Traer hosts an annual Winding Stairs Festival every August as well as holiday activities in December. My ancestors lived in Traer, Iowa in the 1800’s after the Civil War. My great grandfather, William James Dey Ermand, was a dentist there. He married Lillian Sophia Healy, who was a milliner in the town. They had five children, my grandmother Vinnie Ream, her brothers Donald, William, and Leo, and her sister Ruth. If anyone has any information on them, I would love to hear from you. Does anyone in Traer remember Dr. Yazarian M.D.? I believe he was a victim of the Armenian genocide in 1915. I also believe, he is the brother of Dr. Arshag Yazarian who was a physician in my home town in Illinois. Yes I do his daughter Karla is a close friend of mine. Thanks for your response. I had read where there were 3 Yazarian brothers who all became doctors in Illinois one of whom was Arshag who practiced in Oakwood, Illinois; and one of whom was your friend’s father. I was just curious where the other brother ended up. Do you or your friend know where as well as his name? I am doing this just for my own personal curiosity. I was reading some about the Armenian genocide last year when I wrote this.